Social Performance Management (SPM) – SATIN CREDITCARE NETWORK LTD.
At SCNL, we strongly believe that community enrichment is the key to success for every organization today and is a measure of how effectively an organization’s mission statement translates into actual practice. While the business of SCNL is finance, the company’s vision and values interpret into the manner in which we conduct our operations and who we offer our services to – SCNL is dedicated to reaching out and touching the lives of financially excluded sections of society and helping widen the range of opportunities for them. The company’s approach to alleviating poverty involves Social Performance Management (SPM), which helps convert SNCL’s social mission into reality. Efficiently deployed, SPM affords a better understanding of customer needs and equips SCNL with the ability to deliver more insightfully designed products and services that can truly help transform a community. 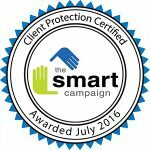 Thanks to its robust standards of client protection measures, SCNL was ‘Client Protection Certified’ in July 2016 by The Smart Campaign, a global initiative to incorporate strong client-protection practices into the microfinance industry. Since the launch of this international program in January 2013, a total of 100 institutions across the world spanning Latin America, Eastern Europe and South Asia, have been awarded this certification; and SCNL has now joined the ranks. The ‘Client Protection Certification’ program publicly recognizes organizations that provide financial services to low-income households and whose standards of care uphold the Smart Campaign’s 7 Client Protection Principles, which cover significant topics such as pricing, transparency, fair and respectful treatment and prevention of over-indebtedness. Surveillance audit of the Certificate conducted by MicroFinanza Ratings Srl (MFR) during October- November 2018, further validated that SCNL continues to fully adhere to the Smart Campaign Client Protection Principles (CPPs). SCNL organized a series of 11 ‘Women Leadership Empowerment Workshops’ across its operational regions, with support from the Nordic Microfinance Initiative (NMI), a public-private partnership between the leading Norwegian financial institution and the Government of Norway. Centre Leader workshop was organized with the objective of strengthening social performance at a grassroots level, by sharing information regarding financial literacy, banking knowledge, Government social security and welfare schemes among others. Discussion on social issues like women empowerment, girl child education, the importance of savings, safe sanitation etc. are also encouraged at these events. Barring a few urban and semi-urban centres, almost all of SCNL’s areas of operation are places with little or no access to safe water and sanitation facilities. Following extensive market research and subsequent pilot conducted by SCNL in 2016, it was discovered that despite the upfront cost of a toilet or a piped water connection being equivalent to a household’s entire monthly income, many people were willing to make such infrastructural investments if only they could spread the cost over time, by saving or borrowing. Recognizing this, SCNL launched small ticket size loans for its clients, thus enabling them to establish water and sanitation facilities in their households. Since then, SCNL has reached out to over 30,000 households, most of which cannot afford toilets at all and are only partially eligible or completely ineligible for direct Swachh Bharat Mission (SBM) assistance. Through its water and sanitation loans, SCNL is working closely on SBM and driving this social responsibility to ensure that they have healthy clients in their portfolio. With a view to make villages more independent and progressive, SCNL’s ‘Clean Energy Loans’ initiative serves to further reduce the traditional dependence on kerosene oil for lighting purposes. Towards the end of 2017, SCNL upgraded its simple solar lamp launched the previous year, into a total solar home lighting system, enabling better access to electricity for its customers. The company is presently disbursing loans to facilitate the purchase of different solar lighting products across Assam, Odisha and Rajasthan – so far, over 33,000 green loans have been provided across SCNL operating regions. SCNL regularly runs campaigns focusing on health and hygiene concerns of the community it works with, in addition holding frequent health check-up camps. On average, about 300-400 villagers attend these camps at each location, thus benefiting from completely free health examination and due medical care, provided by expert doctors. In the past two years, SCNL has organized a total of 17 such health check-up camps for their customers and families, across all its locations. On its part to spread awareness on Sarva Siksha Abhiyaan among villagers, SCNL supports local government schools by facilitating access to clean water for students and providing school bags, pencils, erasers, sharpeners and notebooks to all students. The company also holds quiz competitions, runs sanitation campaigns and more for schools students, with hope of strengthening the community connection. Every year, following the worst of the monsoon, SCNL organizes relief activities and the distribution of ration to villages in the flood hit districts of Bihar and West Bengal. The SCNL field team at the affected locations perform a need analysis and alert the company to the specific requirements for victims and flood relief plans, keeping in mind that the objective is to help as many families as possible. In addition to ration distribution at our branch offices, SCNL relief teams also travel to flood hit areas in jeeps and boats in order to distribute ration packages and blankets to the victims. SCNL’s core operations team is client protection certified. SCNL organized a training program by Micorfinanza Rating Srl, aimed at familiarising operations team with SMART certification 2.0 standards, for addressing any identified gaps and enhancing business practices around client protection. The training was organised in 4 batches across locations for our senior and middle level operations team, in June 2018.